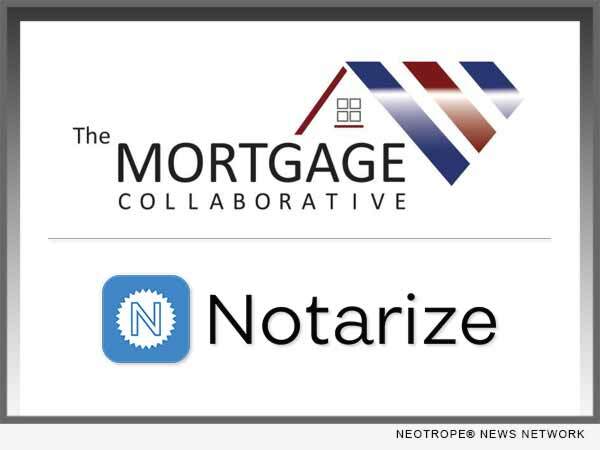 SAN DIEGO, Calif. /California Newswire/ — The Mortgage Collaborative, the nation’s only independent mortgage cooperative, announced a new partnership with Notarize, the nation’s first entirely digital mortgage closing and remote notarization provider, adding them to the preferred partner network. Notarize for Mortgage is the first digital platform to enable an entirely legal and compliant online mortgage closing process. Notarize is closing mortgages online in partnership with major lenders and title underwriters/agencies – enabling borrowers to close online whenever and wherever they choose. Verified by Fannie Mae and Freddie Mac, the Notarize for Mortgage platform digitizes the entire closing process with technology to securely coordinate lenders, title companies and borrowers online. Notarize for Mortgage’s online closing platform offers borrowers a fundamentally better experience, reduces costs for lenders, accelerates the sale of loans into the secondary market and gives every constituent greater trust and visibility into the validity of mortgage documents. For now, online closings with Notarize are available to borrowers in Washington, Virginia, Illinois and Montana. Notarize plans to expand across the country through their strategic partnerships with title underwriters/agencies and other key ecosystem stakeholders in very short order. Notarize is the first notary public platform allowing any person or business to get their documents legally notarized online. Notarize is also the first company to enable an entirely online mortgage closing process. Founded in 2015, Notarize has helped tens of thousands of individuals and businesses (on every continent, except Antarctica) get documents digitally notarized. For more information, please visit https://notarize.com/business/mortgage.